We’ll hold our monthly meeting on Friday, December 7, at 7:45PM, in room 215 of Davis Hall, the Aerospace Engineering Building. Riders from the Montgomery area are welcome to meet at the home of Russell Whigham, 518 Seminole Dr., and carpool over to Auburn. Plan to be ready to leave for Auburn at 6:45PM. Our dark-sky star party this month will be on Saturday, December 15, at Cliff Hill’s farm. Dec. 15, Star Party at Cliff Hill’s farm. We had to push-back our planned stargazes with Tuskegee Airmen NHS and Forest Ecology Preserve, due to their busy schedules. We’ll try again after the new year. But, we ARE still on for next Tuesday’s (December 11) visit with the Webelos Stargaze for Cub Scouts in Montgomery at 6:30, at St. James Methodist Church on Vaughn Road, in east Montgomery. Please let me know if you can help with your telescope. See the November Astrofiles for the requirements for their Astronomy Belt Loop and Pin. We’ll begin with an indoor talk about how the sky works and the tools astronomers use to study the sky before going out to the telescopes in the field behind the church. I think we should plan to arrive by 6:00. Jupiter should be high enough to view, we can share some binary stars and an excellent ISS pass. Here's a map and a Campus Diagram sent by den leader, Allen Gilbert. 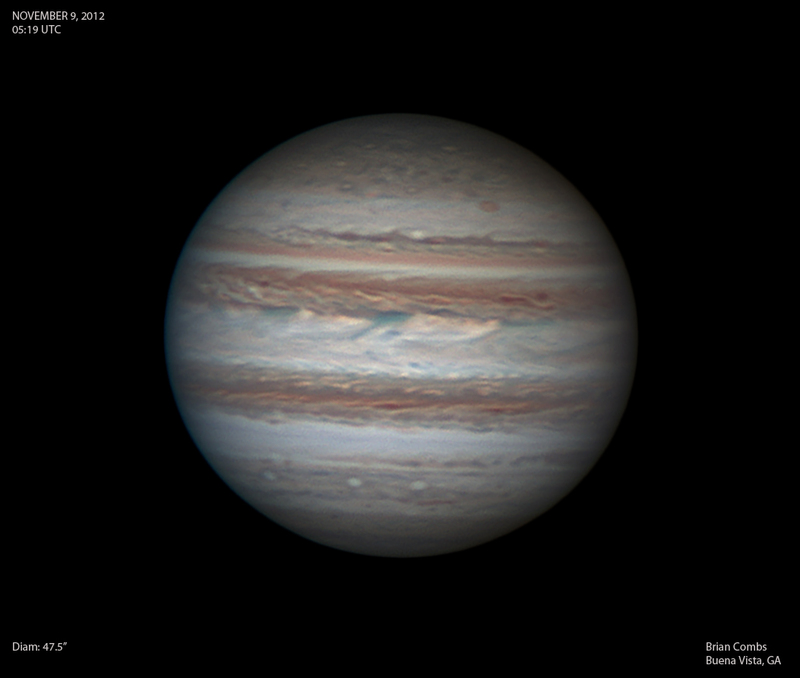 "Conditions were better than any I have seen this year when this image [of Jupiter] was taken last night." On the 12th anniversary of crews continuously living and working aboard the International Space Station, NASA announced Friday a new service to help people see the orbiting laboratory when it passes overhead. "Spot the Station" will send an email or text message to those who sign up for the service a few hours before they will be able to see the space station. On a recent C-SPAN2 interview with Ray Kurzweil, I was intrigued by this man’s brilliance, so I Googled him in [Wikipedia] and learned of the “spoken articles” Wikipedia has online, a technology he developed. Here are the spoken articles in the Physics and Astronomy section — if you like to learn with your eyes closed. I have been working on receiving and eventually transmitting signals to the ISS. Although this is not exactly astronomy, it is near space. There was a great ISS pass his morning at 4:55 AM. Just finished 5 AM ISS pass. Picked up the packets as soon as it came over the horizon from Mexico. Packet activity increased significantly as it passed over the US. Definite Doppler shift. I compensated for that with having six different frequencies preprogrammed in the FT 60. Overhead the signal was enough to break squelch. New member, Scott A. Cook from LaGrange. Scott must have been a very good boy this year. His wife has surprised him with a pair of 20X80 binoculars and tripod. Can’t wait to have a look. I sent out club subscriptions for Sky & Telescope and Astronomy magazines today. Only had 4 members for Astronomy magazine but at October meeting we decided to order extra subscription and make it a "Door Prize" for each meeting.